Finding Peace at Solitude House ~ The History Girl! It is not often that you come across a historic site which has so many unique facets that it can take hours to explore and appreciate all of its aspects. 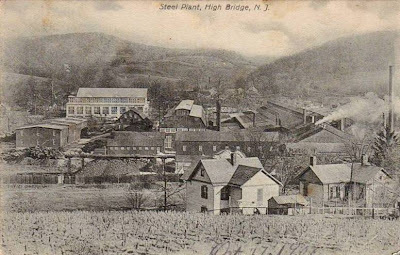 High Bridge, New Jersey, a small community off the beaten path, but not far from Route 78 and Clinton is just that - a town with a main street that developed around an industry that has survived to this day, played a part in the Revolutionary War, and contributed to the industrial growth of the American economy. However, it is that obscurity that has enabled this historic community to thrive and stand the test of progress. Pulling into the driveway of Solitude House transports visitors back in time, away from the main road and into a secluded, wooded area. Solitude House was built in 1712 as a Germanic style stone home and was part of a 10,849 acre parcel of land that would become the Union Iron Works. The home’s first documented resident was General George Hackett who became the superintendent of the adjacent ironworks established in 1742. Just a short walk from Solitude House, the ruins of the Union Iron Forge can be seen. The Union Iron Works was founded by William Allen, a Supreme Court justice in Philadelphia and Joseph Turner, a sea captain. The two purchased the acreage, totaling over 10,000 and proceeded to produce iron. The forge initially produced farm implements and other items essential to everyday life in colonial New Jersey. Between 1742 and 1750, Hackett dealt with Native American Indians who frequently raided the Forge for supplies and constant uprisings from squatters. Hackett was succeeded by Robert Taylor as superintendent in 1775. Under Taylor’s command, the forge turned its production to cannonballs for George Washington and the Revolution. The cannonballs produced at Union Forge were utilized at the battles of New Brunswick and Trenton. The original 1742 forge consisted of a chimney made of stone and was used for smelting iron from its impurities, called pig iron and when further purified, wrought iron. The ruins from this forge are still visible today, preserved and restored. As the iron works expanded, so did Solitude House. The home doubled in size in 1775 and again expanded and underwent significant renovations in the 1850s, which give the home an early Victorian appearance. During the Revolutionary War, General Washington and his wife Martha visited, as well as General Lafayette, Col. Charles Stewart, Aaron Burr and the last royal governor of Pennsylvania, John Penn and his Chief Justice Benjamin Chew who were held prisoner at Solitude House for seven months. Five generations of the Taylor family resided at Solitude between the years 1742 and 1914. Still standing on the grounds of the Solitude estate is a small stone structure which provided housing for slaves/servants and a barracks building which was used to hold John Penn and Benjamin Chew during the Revolutionary War. In 1803, Robert Taylor purchased control of the forge. His grandson, Lewis H. Taylor, greatly enlarged the works after the Central Railroad of New Jersey was built past the site in 1852 and began the manufacture of railroad car and track fittings. The firm imported the first Nasmyth steam hammer into the United States in 1854. From 1860 to 1868 the iron works were operated as the partnership of Taylor & Large, and for two months in 1868 as the Lahlatang Iron Works. The Taylor Iron Works was incorporated in 1868 and reorganized as the Taylor Iron & Steel Company in 1891. In 1892 Taylor acquired the American rights to manufacture manganese steel. Two years later, William Wharton, Jr., & Co. contracted with Taylor for manganese steel rails for street railways. The Wharton firm merged with Taylor in 1912 to form the Taylor-Wharton Iron & Steel Company. Knox Taylor, the last of the Taylor family to head the company, died in 1922. Taylor-Wharton acquired an interest in the Yuba Manufacturing Company of California in 1933, adding the manufacture of dredge buckets. It acquired the American Frog & Switch Company of Hamilton, Ohio, in 1934 and operated it through 1950. In 1949 the company absorbed the Weir Kilby Corporation of Cincinnati and Birmingham. After celebrating its 210th anniversary in 1952, Taylor-Wharton was acquired by the Harsco Corporation. 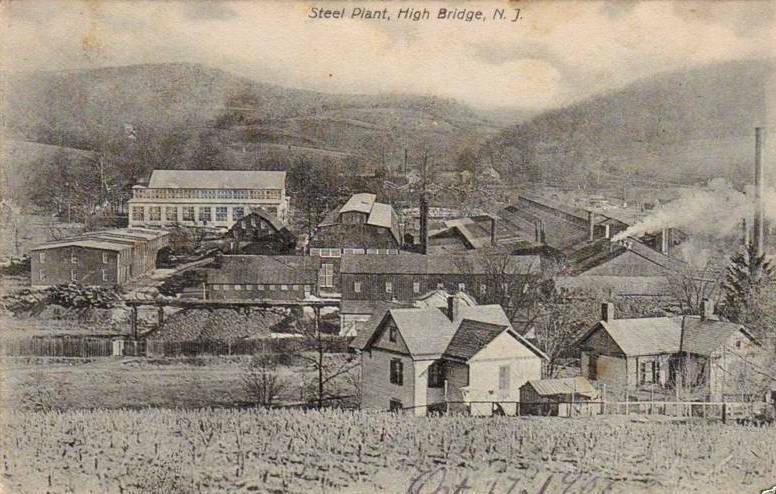 The High Bridge plant was finally closed in 1970, thus ending a chapter for the oldest iron and steel company in the United States. The iron works holds the distinction as being the second oldest business in the United States and America’s oldest continuously working foundry. The Taylor Iron & Steel Company in 1906. As with the end of the Taylor-Wharton era, Solitude was nearly lost to demolition before the Borough of High Bridge gained ownership in 2000. The Union Forge Heritage Association opened Solitude House Museum in 2002. The interior of the Grand Room at Solitude House. The T.I.S.C.O. complex is a twenty-five acre tract of the original steel company property which contains a stone office building and Shop E, the grinding shop. The stone office building is believed to have been built in the 1720s, not long after Solitude House. It has always housed the main offices of the steel company and the office of the president, from William and Allen in 1742, through George R. Hanks in 1972. The building was also used as a general store and infirmary. The structure was expanded in the mid-1800s with a right side and rear elevation addition. In the early twentieth century, a third floor and a second floor rear elevation was added. Originally the building featured a front porch, which was removed in the late 1930s or early 1940s and replaced by an ornate entrance, stairs, and over-the-door tablet. This structure remained a centerpiece of the iron works until it closed in the 1970s. It is believed to be the oldest surviving office building in the United States. Shop E, or the grinding shop, was constructed in 1904. The building still contains much of its original equipment. Next to the Solitude Estate is Lake Solitude and the Lake Solitude Dam. The original dam and crib dam were constructed in 1859 to provide hydro-power and hydro-electric power to the Taylor Iron and Steel Company. The original earthen part of the dam was only 25 feet wide when constructed, then over the next 150 years was increased in width to its current size of 500 feet. The crib dam was replaced in December 1908 with the current spillway structure that is seen today and is known as the stone buttress dam. The dam was designed by New Jersey Engineer Col. Frank Tainter. The buttress dam is unique and historic due to its construction type. The dam is constructed with concrete encased steel beams that are anchored into the bedrock, and reinforced with stone buttresses. This dam structure is the earliest example of a steel reinforced dam, and the last remaining example of a buttress dam left in the state of New Jersey. In 2010, The Union Forge Heritage Association created a seven mile trail to connect all of High Bridge’s historic sites including the TISCO complex, a 100 year old steel truss bridge (restored entirely by volunteers), the Union Forge, the Solitude Estate, Lake Solitude, Nassau Acres and Springside Farm, once owned by Archibold Taylor. The Taylor Steelworkers Historic Greenway was a massive undertaking to connect these historically and culturally significant sites. The Iron Truss Bridge along the Taylor Steelworkers Historic Greenway. Today, the relationship between the Union Forge Heritage Association (UFHA) and the Borough of High Bridge is anything but peaceful. A dispute over the lease terms at the Solitude House has caused the Borough of High Bridge to order the UFHA to vacate by October 2012. The lease offered to the organization allows for three, five year terms. In order for the UFHA to receive funding and grants from the State and County, a lease must be made for at least fifteen continuous years. Unless the Borough Council can offer a lease that pleases the UFHA and enables them to continue receiving grants, the nonprofit must close the museum and move its collection elsewhere. It is our hope that the governing body in High Bridge can find solitude with history and ensures that the site is preserved by the UFHA, who has worked for over twelve years protecting and interpreting the rich history of this hamlet in Hunterdon County. I wish to keep this part of history alive for others to see and enjoy. Good work.